Oh, that pesky Pfalzgrafin corset… It’s technically dated to 1598, by virtue of being found on the body of Pfalzgrafin Dorothea Sabina von Neuburg, who was buried then. It would be really-amazingly-super-conveneint if it was older, wouldn’t it? Seriously. I’ve really got an itch to do something from the middle of the 1500s. I’ve started the little chemise (I’m even trying to embroider the darn thing), and I’ve been messing around with recreating the Pfalzgrafin pattern based on the Basic Conic Block. 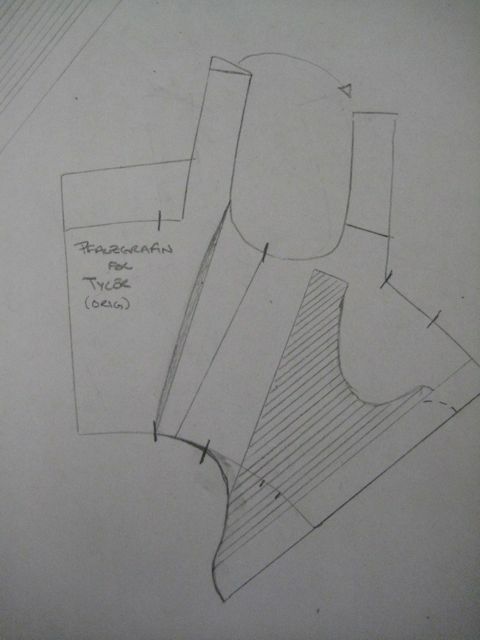 Here is the corset I want, taken from Patterns of Fashion 1 (pg 112). Note: I reversed the front strap piece, because it flares away from the body when pieced as shown in Arnold’s original illustration. 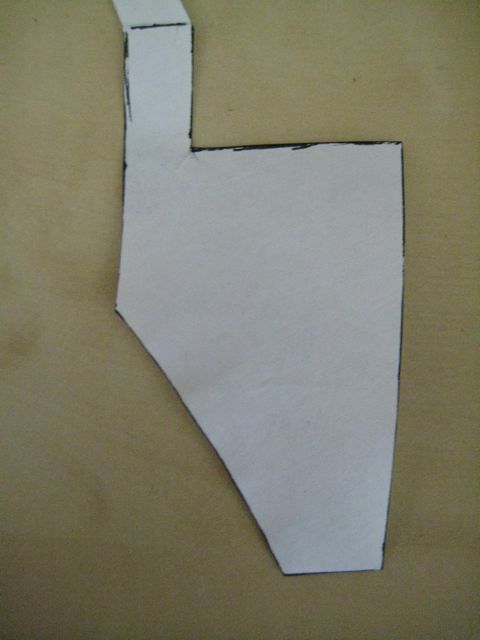 I made up a little paper reconstruction and folded it to get an approximate sideline. By this incredibly scientific method, I have a Front Bust of 15″ and a Back Bust of 12.5″. (A half inch has disappeared somewhere. Like I said, incredibly scientific…) The Front and Back waist are both 10″. The ratio of Bust to Waist for the corset is 7:5. The Block alteration (right) isn't quite the same as the one from Arnold (left). There are some differences, right away: while both Center Back lines are vertical and both Center Front lines lie on pretty similar angles, the bottom line of the corset is substantially different. What gives? 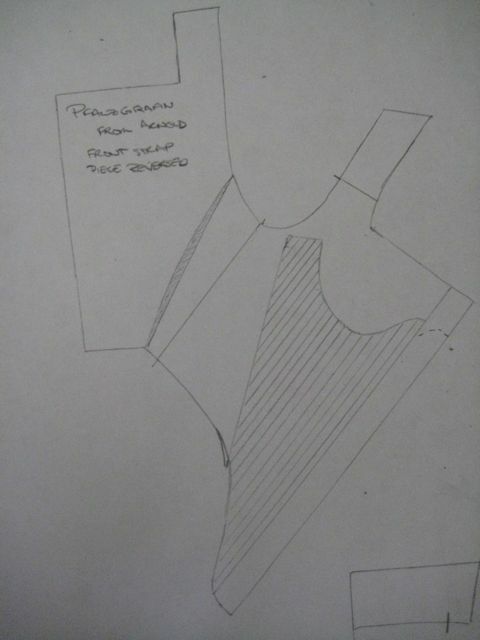 The front of the Pfalzgrafin corset is cut as a straight panel. 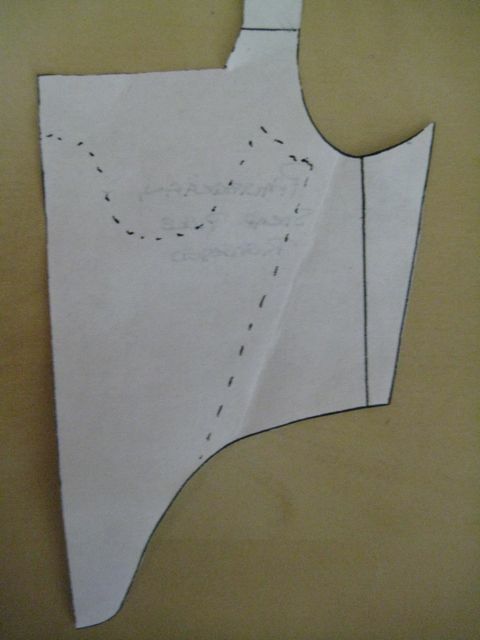 An inset at the side back increases the top of the corset for the bust. 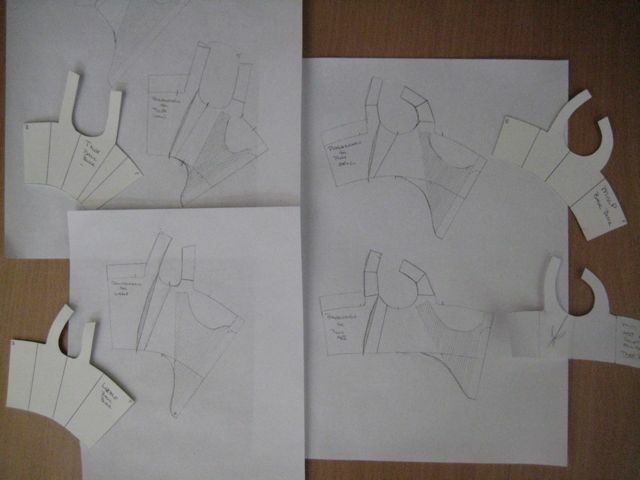 You can see a faint fold in the picture – that’s the side-line I got when I put the front and back pieces of the corset together and folded them to get a rough idea of where the side-line is. Yipes! Further waist shaping is done at the side back of the corset. If you remember all the explanations on the whys and wherefores of the Conic Block Draft, one of the things we were trying to accomplish was to make sure that the block modeled the shape of the wearer. Our waist line is on a curve, rather than a straight, so that things lie more comfortably on the body. Now, on someone of Dorothea’s size (again, it’s a 20″ waist), that straight line isn’t going to be too much of a bother. On someone, say, my size (be nice to me and assume there’s only a 12″ difference between her waist and mine), that’s going to be tragic. The waist line will be long enough, and the difference between a curved and straight waist pronounced enough, that the bottom edge of the corset would angle over my hip. Youch! That’s not comfortable. (I speak as someone who didn’t think about how things work so much when she was younger.) Incidentally, if you’ve tried a straight size-up of this corset and had the waist mysteriously turn out to small, this is why. Shape really does matter. The corsets are for a serious hour-glass (upper left), less hour-glass (lower left), almost-column (upper right), and true column (lower right). The blocks are with them to give you an idea of the original bodies. This one is based off the block for Tyler Wentworth. See how far back the waist point is? If you put a moderately straight front corset on a curvey body (top left), the body will win (top right) and flip the bottom of the corset up to get a little breathing room. 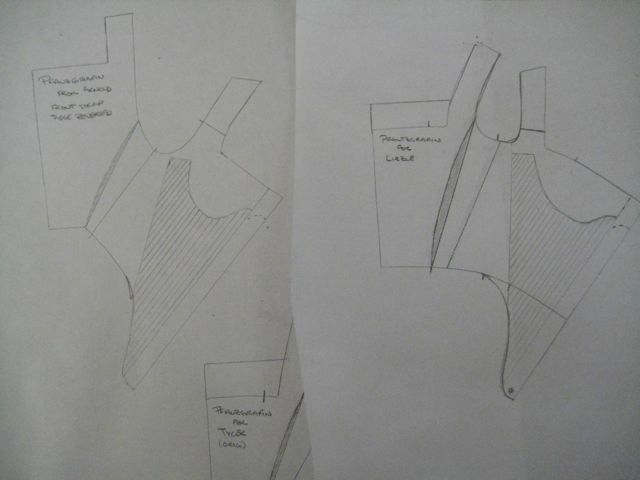 The solution is to angle the front of the corset outward to accommodate the body (bottom). Corsets that move the entire torso like this do come into play in later eras, but they require a heck of a lot more engineering and a relatively firm foundation in the hip region. The bodice/corset of the sixteenth century is anchored on the waist and the shoulder. The front point really doesn’t have enough structural support to do any major containing of the stomach. (I suspect this is why the incredibly long busks of the early 1600s became all the rage – it was a line that had previously been impossible. Also, please excuse the slightly off waistlines in my drawing – I’m working inside the bottom margin of my notes for an eBook on block manipulations for 1550-1600. 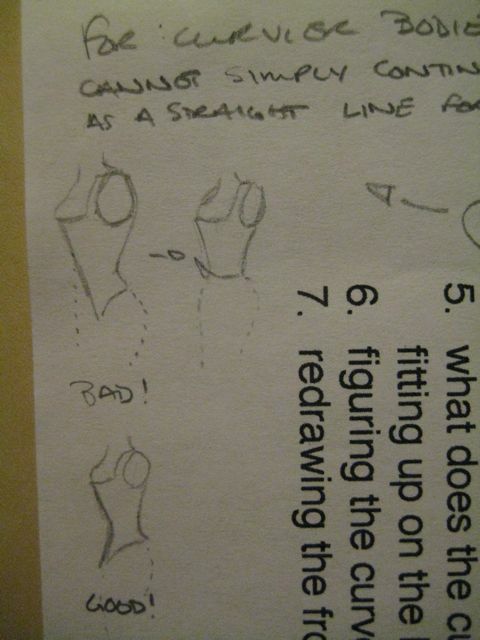 So, a) the drawings are really tiny, and b) I’m going to need a much catchier title. Teehee….) This is why most of the period patterns and reconstructions you see in Arnold, Alcega, etc show a slight curve to the front, especially at the waist. It’s not the bust that was giving the period tailor grief – it was the stomach. Arnold, Janet. Patterns of Fashion: The Cut and Construction of Clothes for Men and Women c1560 – 1620. New York: Drama Book Publishers, 1985.